It’s 1.00am, Was talking to Martin (who’s back in manchester) about some crazy network security stuff. That’s damn impressive if it was felt 250 miles apart! Posted on 26th February 2008 Categories Old Blog2 Comments on EARTHQUAKE!! On wed night while heading back north for the rest of my week off, an articulated lorry changed lanes into the side of me, and span my car off and over into the hard shoulder, on it’s side. I dont think I can say anymore or give exact details until the police have finished their investigation, but apart from neck/back pain and stitches down my right arm, i’m fine. Sadly, the truck driver did not stop, and no-one got the registration number, so depending on what the insurance company say, I could be without a car for quite a while. Anyway, Thanks to everyone that stopped on the M1, and the ambulance team/doctors at Watford A+E. OK. This is the first in a number of ‘update posts’ covering what I have been upto in the past few months. 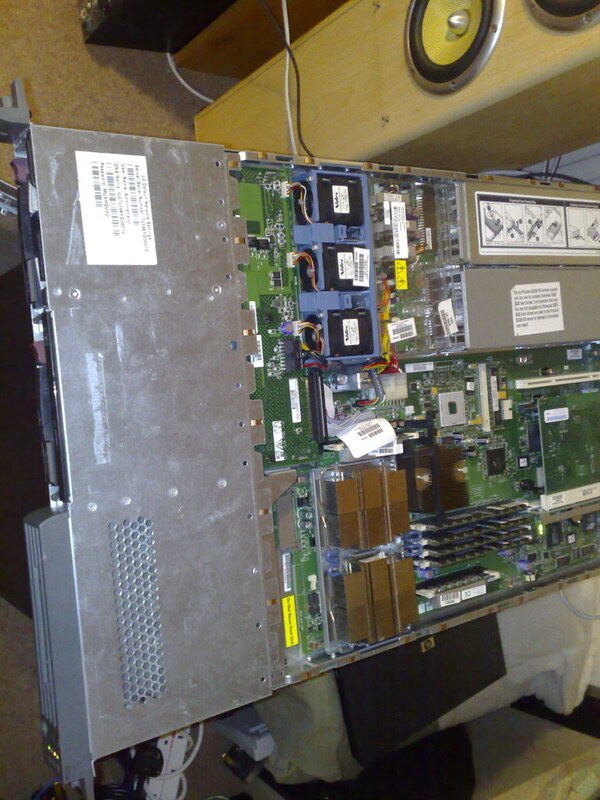 A while ago (Jan 4th I think) While searching for a new server to replace my Dell poweredge (huge, heavy, and pretty slow) for something with a little more horsepower, I noticed a server on E-bay, that was going for stupidly cheap, with not long to go. In the description of the auction, it said the system would not boot, and powered itself down within 5seconds of startup with what was basically fan error. I pulled up the specs/hardware docs for the server and decided at worst it would be a broken fan module, and at the following specs, it would be worth taking the risk of 100 quid (would usually go for at least 500). 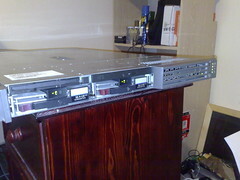 Picked the server up and drove home (1.30 hrs each way I think) I got it home, plugged it in (loud!!) and yup, the error message was still there. But all of the fans I could see were spinning, so I tried to reset the error, or mask the error in the bios / LOM.. No luck. Next I took the fan module out that the system was complaining about (PSU / System board fan modules at LHS of unit) and tried turning each of the six fans (3×2 configuration) manually… One was stuck! Looked inside it.. and there was a tiny bit of muck/wood chip/plasterboard/something wedged between the fan blade and the outside casing of the fan. Removed it with pliers… and put the fan module back in..
System instantly booted, right into RHEL5. Fast as foobar! Anyway… Before we proceed, Pictures! Not bad for 113 cashmonies! 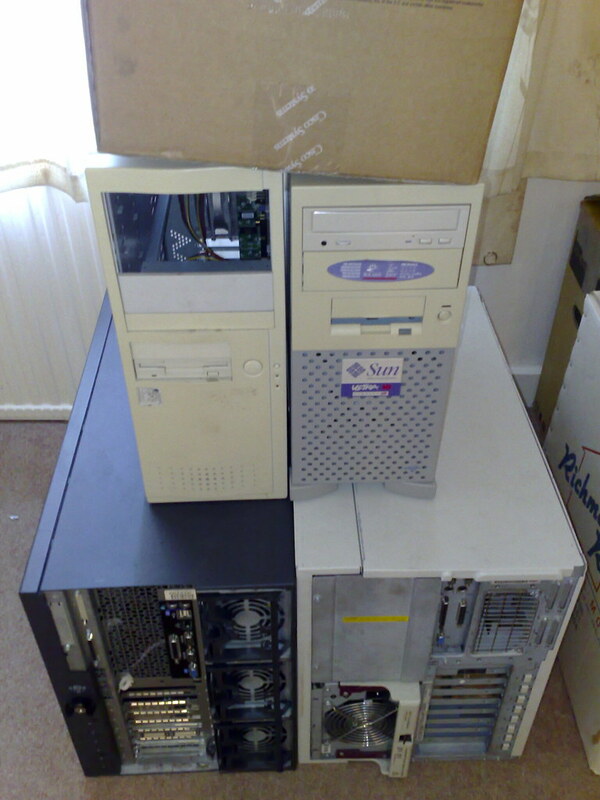 Anyway, The next task was going to be moving all my virtual machines off the old VMserver onto this one (and then take the old one offline) However, As I am using different versions of Vmware.. That didn’t turn out to work. So I used this as an opportunity to move the VM’s away from gentoo and do a full re-install of the services from scratch. Old compaq server, Dual 500Mhz Xeons, 1GB ECC Ram, 36Gb Scsi disk. 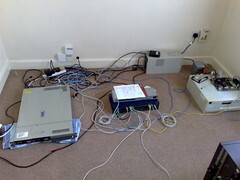 Running pfsense for house firewall. Pfsense – 2 NIC’s from the server provided exclusively to this vm, allowing me to virtualise the house Firewall, keeping it separate from the internal network. Old server has now been taken offline, and will be flogging it so that I dont have to move it when i move house! After such a geeky post… is anyone up for a Saturday afternoon pint or twelve?